Since 2010, B4Tcomm is Valle Nevado Sli Resort communication agency in Brazil, responsible for all the ski station online and offline communication, including event organization, social media management, press office, digital influencers relations nad marketing campaigns. Among the latter is the management and overview of action involving Brazilian celebrities. B4Tcomm has been conducting, in a partnership with Editora Globo, the Inverno QUEM Acontece (Winter QUEM Happening) event, widely publicized by the partner social magazine (the QUEM magazine) from June to August. 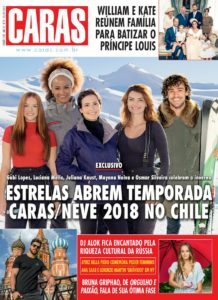 with the closing of the Editora Globo print magazine, B4Tcomm secured a partnership with the CARAS magazine, for a new celebrities winter season in Chile. The season success led to the partnership renewal with the weekly magazine for 2018, carried out during July.